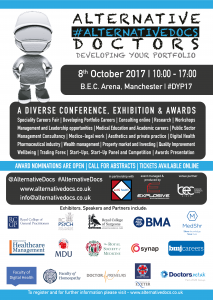 We would like to thank you for attending our ‘Developing Your Portfolio’ conference, expo and awards on Sunday 8 October 2017 in Manchester! 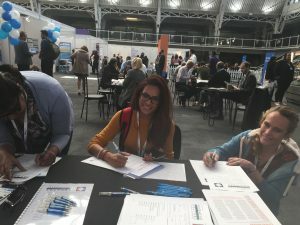 You might have also just attended the BMJ Careers Fair and spoken to members of our team! 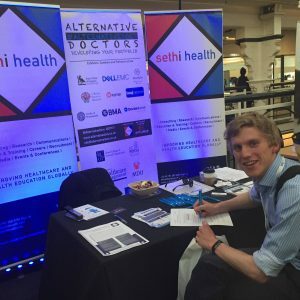 1) We are pleased to announce that in an exclusive partnership with Sethi Health we will be offering distance learning online as well as blended learning MBA and postgraduate programmes specifically for healthcare professionals. 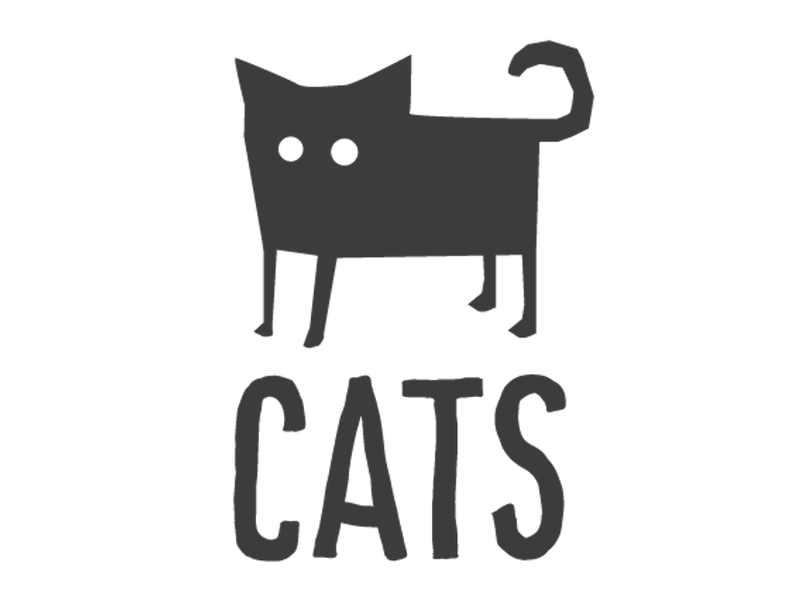 This will be accredited by a top UK Business School. Please e-mail office@sethihealth.com to express interest or for further details. 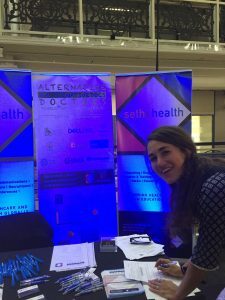 3)Opportunities to join Alternative Docs team as an ambassador or core team member. 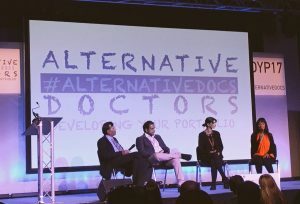 Please e-mail info@alternativedocs.co.uk with your CV. 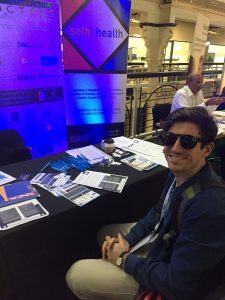 All ambassadors are entitled to free access at all our events through the year and can build their network with our partners. 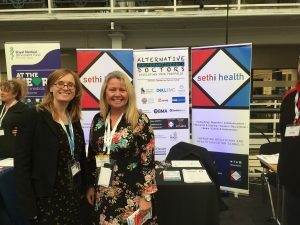 4) Job Opportunity: Sethi Health are expanding and looking to offer part time roles to clinicians looking to expand their portfolio in the UK, India, Middle East and Europe. 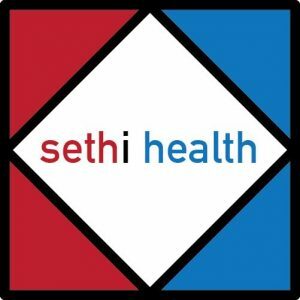 Please e-mail sudesh@sethihealth.com to express interest along with your CV and cover letter regarding your interests. 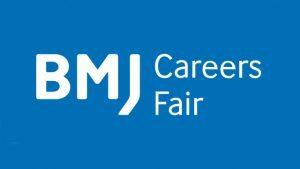 October: Alternative Doctors Stall at the BMJ Careers Fair on 20 – 21 October in London, it’s free to attend! Please see the conference programme below. There will be filming throughout the conference, expo and awards 2017. Sessions will be broadcasted live on social media and our website for those unable to make it to view. 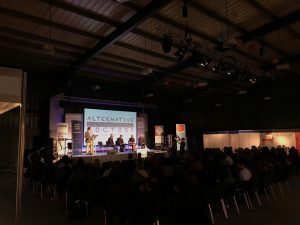 Please use the hashtag #DYP17 and follow @explosiveents @alternativedocs and @sethihealth for live feeds and updates. 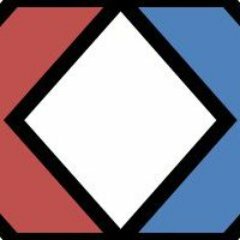 We will have official photographers and media representatives covering the event and a post event press release will follow for all award winners and panel speakers. Our aim is to showcase the diversity of roles available within the NHS and beyond. We support healthcare professionals to explore diverse sectors and lead fulfilling careers. This conference is not only for medical students, trainees, GPs, Consultants and Dentists, it is open to all professionals. Professor Shafi Ahmed – Consultant Colorectal Surgeon, Royal London Hospital. International Lead, Royal College of Surgeons. Associate Dean, Barts Medical School. 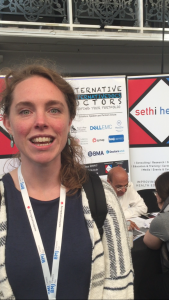 Director, Medical Realities and Virtual Medics. Dr Anil Jain – Consultant Radiologist, Manchester University Foundation Trust. Deputy Chair, BMA Consultants Conference. Executive Member, Northwest Regional Council. Chair, Asian Breast Cancer Group and Patient to Patient Support Initiative. Mr Andy Anderson – Chief Executive of the Association for Simulated Practice in Healthcare (ASPiH). Director Vopulus Limited. Dr Umesh Prabhu – Patient Safety Leader, Former Medical Director (15 +years) and Consultant Paediatrician. 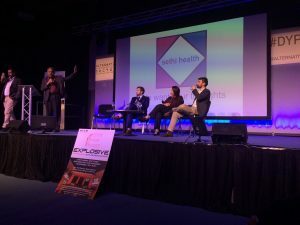 Dr Matthew Alexander – Quality Improvement Lead, Sethi Health. Former Clinical Fellow for Health Informatics at Queen Elizabeth Hospital in Gateshead, Tyne and Wear. 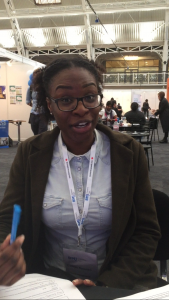 Ms Sadia Qayyum – Northern Lead, Practice Pharmacists Group and Lecturer, University of Manchester. Award Presentation: Dr Rangan Chaterjee (GP | Real Food Junkie | #TEDx speaker | As seen on @BBCOne show #DoctorInTheHouse. Dr Bryan Mcintosh – Consulting Editor, British Journal of Healthcare Management and International Dean, University of Bradford. Ms Nicola King, Director, Guild of Health Industry Consultants. 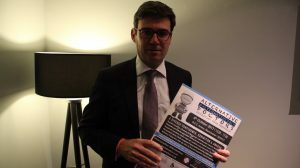 Dr Spencer Gallagher, Former Emergency Doctor and Consultant, Proctor Gallagher Consultants. Prof Shafi Ahmed, Founder, Barts X Medicine. 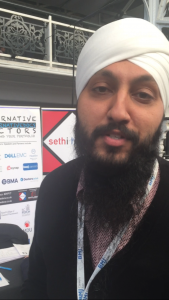 Director, Medical Realities and Virtual Medics. 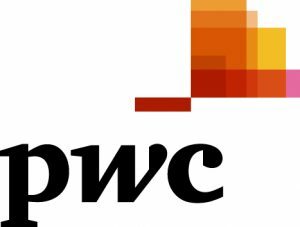 Mr Adnan Zaheer, Senior Finance Partner, PWC. 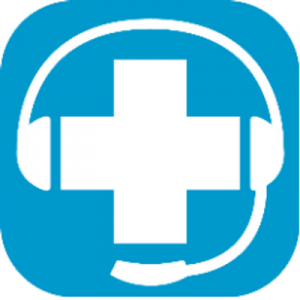 Dr Cos Fantis, Medical Business Development Manager, Dr Morton’s – the medical helpline. 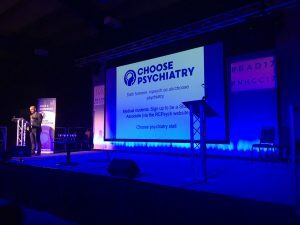 Dr Jon Morris – GP, Director of Year 2, Swansea Medical School. Crowd and Event Doctor. 4 British Medical Association Library Keynote and over 10 Prizes to be won at the conference! The day will include seminars, dedicated workshops with leading figures from industry and a diverse exhibition. 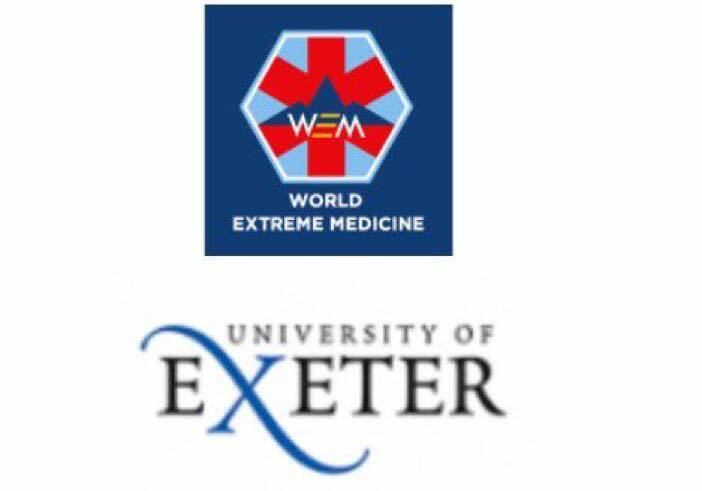 Royal College, RSM, Doctors.net and BMJ members – please contact us to access discount codes. 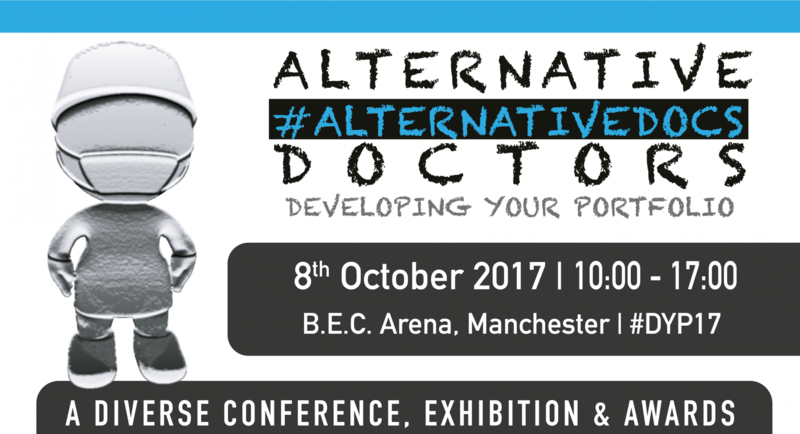 Please e-mail info@alternativedocs.co.uk for abstracts, presentations, group bookings or any queries. It’s not too late to nominate – nominations close on 20 September! 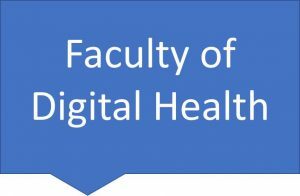 Our awards are supported by the British Medical Association, British Journal of Healthcare Management, the Faculty of Digital Health and many other fantastic organisations! Early Bird Tickets are now sold out. Standard Tickets, Student Tickets and Group Ticket Offers are still available!